Once upon a time in China, a veteran guitarist returned to his hometown Jinzhou in North-Eastern China after roaming the south for seven years. He hooked up with the vocalist of a local black metal band Frozen Moon on QICQ (a totally shameless "made-in-China" replica of ICQ, which ironically became the dominating instant online messenger and drove the original ICQ out of the country long before it was deader than death as now). The band wanted his skills and guitars so much thus invited him to join however the match didn't work out well. After several beers the two went through arguments to reconciliation then an idea to begin their own thrash metal band. Together with the drummer from Frozen Moon plus a few new members, The Punisher began their march in late 2010 and a 4-track demo EP "Public Servants" released a few months later. It is obvious their biggest inspiration besides metal comes from The Punisher. 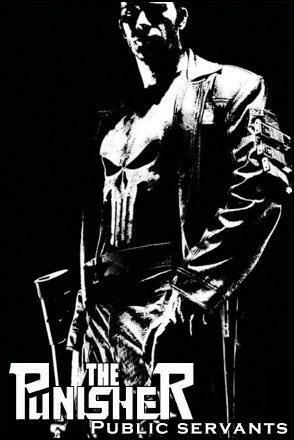 The band not only named themselves after the Marvel Comics anti-hero, but also sampled the promotional graphics of the "Punisher: War Zone" movie as artwork for the EP. Despite its unoriginality the 3-folder cardboard 3" CDR holder is produced neatly. One must respect them in taking this Punisher mantle as well his radical "eye for an eye" beliefs in the highly political sensitive and restrictive China. On top of that the band even sing in their native tongue Mandarin to openly condemn the more than common corruptions and unfairness in the country instead of by the more subtle English. Let's pray for them to escape the fate of censorship which most other socially challenging underground bands in China already faced. Their thrash metal is just as uncompromising as that came strictly from the '80s school, reminding the greats like Testament and Exodus. Even the recording is top notch, extremely crisp yet without the excessive digital touches prevail in the modern "retro-thrash" scene. The raw aggression in their music is not diminished by a bit just as the way thrash metal should be. The title track opens the album with such a primitive force which relives the glorious days of thrash, packed with fast and tight riffs and a splendid solo (which sadly was a studio one-take improvisation even the guitarist himself cannot rehash nor reach the same level of awesomeness again). With the vocalist angrily spits out words in Chinese attacking the so-called "public servants" who rob and extort in the name of a greater good, this is already one of the greatest song in Chinese underground music history, be it (thrash) metal or the independent scene overall. Unfortunately the other three songs are not as polished and completed. The mid-paced "Disfigured" is reminiscent of Testament in their heyday, however the latter half does not make good use of the previous build up and wanders aimlessly. "Rebirth Flame" is repetitive which is essentially replaying the same parts twice, not even a unique solo included. This manner is closer to the '90s thrash bands that pursue groove and minimalism, yet not a very successful attempt. All these can be forgiven for its demo nature that we should look forward to improved rearrangements in future. Finally "Gears of War" brings back the good times, but also brings up a minor matter in singer's voice. Besides typical harsh thrash metal vocal he also practices soaring screams in NWOBHM style. His high pitch vocal does have a very special tone that sounds inspired by traditional Chinese opera singing, making him different from singers in the west with this distinctive favour. However he just goes too high sometimes that may turn some listeners off. Flawed indeed it is, this 4-track demo EP achieves way beyond expectation both musical and production wise. It is safe to say The Punisher has made themselves one of the greatest contemporary Chinese thrash metal band with "Public Servants". 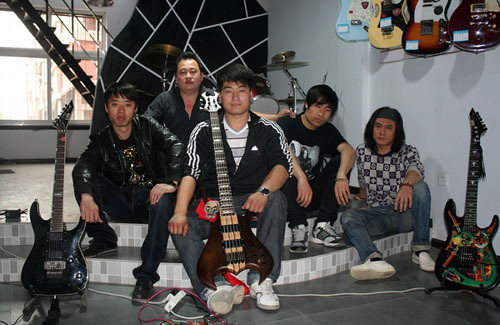 There are a few new demo tracks on their Douban website http://site.douban.com/Punisher that venture into the realm of technical thrash. They definitely deserve a very bright future, just please release the debut full-length soon before being banned or disbanded in this country that anything bad can happen for whatever reason.